The title above is not my own creation, but is derived from an article by Asa Winstanley, investigative journalist and associate editor of Electronic Intifada. 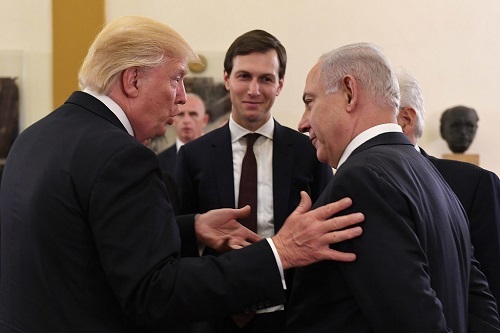 In that essay, Winstanley is examining the reasons why support for Israeli policies in the halls of the US congress is resolute and unwavering. He provides a convincing account of how the American religious right, namely, the Evangelical Christian Right, are the most steadfast supporters of Zionism. For the purpose of the current article, we will elaborate on how Winstanley’s contention fits into the context of current events in the Middle East. Christian Zionism, while being taken to a new level by both US President Donald Trump and Israeli Prime Minister Benjamin Netanyahu, has deep roots in the American political system. The opening of the new US embassy in Jerusalem – relocated from Tel Aviv – highlights the importance of the supportive role of the Evangelical Christian Right – the most fervent lobby for Zionism inside the US political system. The opening of the American embassy in Jerusalem in May this year coincided with the killing of at least 60 unarmed Palestinian protesters at the Gaza wall. The Palestinians have been peacefully protesting this isolation for several weeks by holding rallies and protest actions at the militarised Gaza border with Egypt. Israeli forces have responded with systematic and lethal violence, killing and wounding scores of Palestinians during the Great Return March. The juxtaposition of these killings, along with the opening of the relocated US embassy in Jerusalem, has prompted a series of questions as to why the United States is so unstinting in its support for Israel. One explanation that is put forward to explain this enthusiastic convergence between Washington and Tel Aviv is the existence and activity of an Israel lobby. It is more accurate to say Zionist lobby, but the former expression will suffice. There is an element of truth to this description – there certainly is a powerful Israel lobby in the United States. However, there is one mistaken assumption at the heart of this observation. The main proponents of this Israel lobby are assumed to be Jewish. This belief is inaccurate. The primary warriors of Zionism in the United States are the Evangelical Christian right, the conservative religious fanatics of the Rapture-apocalyptic-welcoming camp. It is fair to say that the US embassy move to Jerusalem would not have been possible were it not for the unswerving support of and aggressive lobbying by the Evangelical Christian right inside the United States. The official opening of the new American embassy was attended by, among others, Pastors Robert Jeffress and John Hagee, two fervent supporters of the Zionist cause. They are leaders of the fanatical Christian movements in the US, who enthusiastically promote the cause of the Israelis. Why do they do this? They view the foundation of the state of Israel, and the move by Jews worldwide to live in that state, as ongoing fulfillment of Biblical prophecy, and the coming of what evangelicals see as the end-times: the Rapture. The latter is an integral part of evangelical Christian belief, where the final apocalyptic battle between the forces of good and evil will take place. Pastors such as Hagee and Jeffress have long preached that those who do not conform to their vision of Christian literalism will be consigned to the fiery pits of hell – and that includes Muslims, Jews, Hindus, Mormons – among others. The pastors and groups that promote this ideology – such as the Christians United for Israel (CUFI) – are also the advocates of the ‘prosperity gospel’. This is the trend among evangelicals that Biblical teachings and following the literal inerrancy of the Bible will result in personal wealth creation. Pastor Hagee is one of these practitioners, who praises the pursuit of individual wealth as a goal in line with Biblical teachings. You may listen to him speaking directly about this topic if you wish. The origins of Zionism – a political movement to create an exclusively Jewish state in the land of Palestine – has its origins not so much in Jewish tradition (important as it is) but in the teachings of Protestant millenarian Christianity. European Christendom, with its long track record of anti-Semitism, has taken numerous steps to expel the Jewish population from its midst. Expulsions, conversions and pogroms have all played a role in pushing the Jews out of Europe. However, it was Zionism, with its religiously-based demand of ‘Righteous Return’ that has promoted Jewish emigration to Palestine. It is no secret that European politicians, such as Arthur Balfour – author of the Balfour Declaration – were strongly Christian and anti-Semitic. By portraying the movement of European Jews into Palestine as a Biblically-sanctioned return of an ancient people to their ancestral land, the colonial-settler nature of Zionism has been effectively disguised. This is not to suggest that every single religious person holds harmful beliefs – far from it. But when religious belief is used to deliberately inflict pain and suffering on another people – in this case, the Palestinians – then we must speak out. The following section of the article is probably going to upset Christian readers, and I will likely be unfriended by many on social media – so be it. My intention is not to offend anyone, but to uncover the uncomfortable realities that lay hidden behind layers of hypocrisy. When religion is used as a weapon to disguise political objectives, then the religious rationales offered to achieve political goals must be examined critically. One of the main narratives that political Zionism has used over the years to justify its conquest and subjugation of Palestine is the notion of ‘righteous return’. According to the Israeli leaders and its supporters, the Jewish people have had a historic presence in Palestine, stemming from the Exodus of enslaved Hebrews from captivity in Egypt thousands of years ago. There is one problem with this story – the Exodus, as it is told in the Old Testament – did not happen. Rabbi David Wolpe, writing in the BeliefNet magazine, stated that there is no archaeological evidence for a mass escape of Hebrew slaves from Egypt. In fact, the Hebrews never were slaves in ancient Egypt. While that pseudohistory makes for great Hollywood epics, it has no basis in archaeology. Brian Dunning, writing in Skeptoid magazine, says that it was privileged workers who built the pyramids in Egypt, but the story of Hebrew slaves gained traction due in part to Hollywood, but also due to the efforts of Israeli leaders. Staks Rosch, writing in the Huffington Post, states that while Jews have derived, and continue to draw, spiritual solace from the Exodus story, it is not a literal or historical account. Israeli leaders since 1948, especially former Army general the late Moshe Dayan, scoured the land of Palestine for archaeological evidence, and have found none. Uri Avnery, long-term Israeli dissident, wrote that once Zionism focused on Palestine, the ancient history of that land took on modern significance. Archaeology and ideology became intertwined, according to Avnery. The historicity of the Exodus and the Old Testament stories had to be established, as another ideological prop to support the colonisation of Palestine. Archaeologists – and Egyptologists, that branch of archaeology directly impacted by the Exodus narrative – have closely examined Palestine for any kind of shard of evidence – and have found nothing. In face, Israel has weaponised archaeology – an expression that is obtained from an article by Kathryn Shihadah. Israeli authorities, since 1948 but especially after the 1967 war, have sought to expunge the rich archaeological history of Palestine in order to boost its own false claims of ancestral return. The archaeological artifacts of the Romans, Byzantines, Crusaders, Ottoman Turkish, Persians – all these are to be scrubbed in favour of an exclusively Israeli nationalistic narrative of ‘righteous return’. These developments are nothing new – back in 2008, Jonathan Cook wrote about how the Palestinians living in Jerusalem are being subjected to a politically-motivated campaign to drive them out. One of the ways the Israeli authorities do this is by using archaeology for modern political purposes. Building new settlements, redrawing boundaries, destroying Palestinian artifacts, and seizing antiquities – these are some of the tactics the Israeli occupation authorities are using to remove any Palestinian presence in the territories they deem to be ‘Judea’ and ‘Samaria’. These are the biblical names for the West Bank. Belief in a particular religion is a decision that every adult makes on their own. They do so for their own reasons, and that is that. However, when a religious belief is used to airbrush out the historical connection and presence of an entire nation – in this case, the Palestinians – in order to construct an occupying authority, then it is time to protest. As Israel adds another chapter to the Nakba, it is time to reject the ideas that buttress the colonisation and occupation of Palestine. 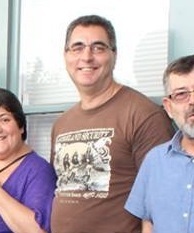 Australian correspondent for Tuck Magazine, Rupen Savoulian is an activist, writer, socialist and IT professional. Born to Egyptian-Armenian parents in Sydney, Australia, his interests include social justice, anti-racism, economic equality and human rights.